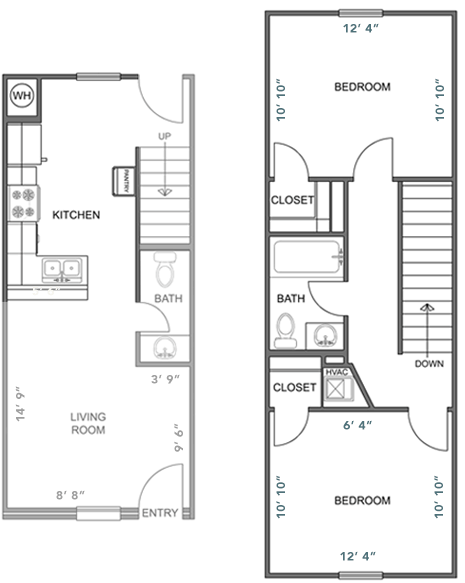 The Aspen is our 1-bedroom, 1-bath floor plan. At 600 square feet, it is perfectly suited for professional individuals or students looking for their own space. Enjoy granite countertops, designer appliances, and a spacious pantry. Spacious with wonderful natural light and a generous closet. Cozy, stylish, and open to the kitchen area. Private, with a walk-in shower. The Boulder is our 2-bedroom, 1.5-bath floor plan. Designed with you in mind, at 864 square feet, it is ideal for the small family or students who enjoy sharing life with others. The Durango is our 2-bedroom, 1.5-bath floor plan, complete with washer & dryer hookups. At 952 square feet, this floorplan is ideal for the small family, young professional or students who enjoy sharing life with others.